Shake what's left of the dust off of this commendable reissue of a rare 1975 release by the trio of Leroy Jenkins (violin and viola), Sirone [Norris Jones] (bass), and Jerome Cooper (piano, drums), skip right to track 3, Jenkins' composition "Col Legno", and try to fathom how this group can have remained as obscure as they have. "Col Legno" is the kind of performance on which great band reputations, like Air's or Die Like A Dog's, are built. As Sirone hauls enormous, rip-sawing drones from his bass using the eponymous technique of striking its strings with the wood rather than the "hair" of his bow—it's a technique you may also recognize from the opening of Holst's "Mars"—Jenkins plays melodies that are both seductive and funky in the best AACM tradition. What is fundamentally a very simple, even minimal idea goads these three musicians into performances of marvelous textural, gestural, rhythmic, and harmonic complexity. The piece concludes with an arco solo from Sirone that is suffused with the strontium-90 sunset hues familiar to fans of Get Up With It. Gradually, the tiniest shafts of blue and white starlight break through these garish bands of orange, pink, brown and purple in the form of high, delicate violin tones. In a freakishly rapid lunar eclipse, Cooper introduces a press roll that overtakes the trio, and the piece ends not with complete darkness, but in a preserved twilight. The other two long tracks here are no less involving. It is just that the excitements they offer are more typical. Perhaps it is simply that the wonderfully jumbled yet propulsive interplay of the entire trio is so engrossing that I find the more episodic ensemble permutations of "Invasion" and "Hu-man" (written by Cooper and Sirone, respectively) slightly less remarkable. Even with only three members and minimal instrumental "doubling", there are several duos and unaccompanied soloists within The Revolutionary Ensemble. On the opening, 27-minute "Invasion", Sirone and Cooper engage in a bass-piano duet. Actually, it is more accurate to describe it as a bout rather than a duet. Theirs is a musical exchange full of blunt intensity and moments during which what might simply make a thud if unaccompanied is graced with a perfectly consonant blow, and achieves something like synchronicity. The problem is, these ingenious if rather abstract studies in dynamics aside, the duet is still missing something. And that something is Leroy Jenkins. With his proudly unamplified, tart, lanky sound, centered nearer the bow rather than the strings or the resonant wooden body of the instrument itself, Jenkins was quite the tonic to the Romantic voice cultivated by the fusion violinists such as Jean-Luc Ponty and Michael Urbaniak. (Here is a history waiting to be told: How the often vertiginous discordance of electric violin strings is an important texture in a good deal of quintessentially "Seventies" music, from the progressive rock of P.F.M. and mid-period King Crimson to the pomp pop of E.L.O., from the Doobie Brothers' "Black Water" to the Mahavishnu Orchestra to the Charlie Daniels Band [don't make me name that song...] to Joe Venuti's marvelous swing collaborations with Zoot Sims.) Of course, Jenkins is also a classically trained player who is more generous with melody than many of his peers from the second generation of great African-American free improvisers, and he generally avoids glibly ecstatic displays of virtuosity. Instead, he concentrates on the construction of brilliantly organized improvisations. His solos on The Psyche are as bold and as memorable as any in his discography. As slight as it is, a string is a very sensual object after all. Put in the service of sound and wound taut, allowed to slacken, plucked, struck, scrubbed, bowed, scraped up (or down) its length rather than stroked than across its breadth, segmented, taped down and re-segmented again... all it takes is a single, casual touch to make a stringed instrument respond. In this respect, violins, cellos, guitars (and pianos, too) are not unlike drums. Yet where drums palpitate, strings bend, and bend to us, is a much more seductive manner. In fact, the acoustical gratifications offered by stringed instruments are bewitching. 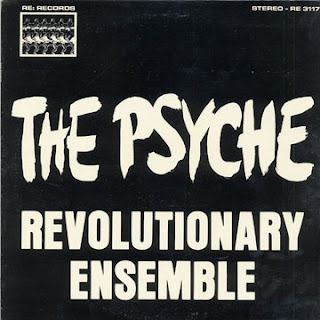 The arrival of The Psyche is unexpected but no less welcome for it, for the record serves as a reminder that The Revolutionary Ensemble was among the finest cooperative groups of its era. Collectively as well as individually, the Ensemble's members faced the temptations attendant upon making "free jazz" on stringed instruments without recourse to castigation, sanctimony, appeasement, or misplaced compassion. To borrow a phrase that had great currency in the free jazz societies of the 1970s, they resisted temptation with the sense that the resistance itself is "as serious as your life". Thanks a million for this one. Amazing blog! just beside Braxton Five Pieces 1975. Cool. I've got a couple of their LP's, but never heard this one!